Ever find yourself spending hours formatting a bibliography for a paper, only to find that a different citation style was required? Ever wonder if there was a better way to organize your PDF files and keep track of what you’ve read? Looking for a single tool to save and organize everything from research articles to favorite websites, from recipes to RSS feeds? Zotero can help you with all of these things and more, and with its recent 5.0 release, it’s more useful than ever before. Zotero is a free, open source citation management tool with a large user community and many functionalities to help you manage all types of files and resources, and to easily cite these sources in nearly any citation style. Zotero works with Mac, Windows and Linux machines, and can be synced to tablets and the web for easy access to your library. One of the strengths of Zotero is its ability to ingest citation information from a diversity of sources beyond research databases and journal articles. With the click of a button, you can import citation data from YouTube or Vimeo videos, Amazon books, image files from Flickr.com, newspaper articles from numerous news outlets, and much more. Note that you can also connect easily from your Zotero library to CMU Libraries resources by setting up the library resolver. To do this, go to Preferences under the main Zotero menu. 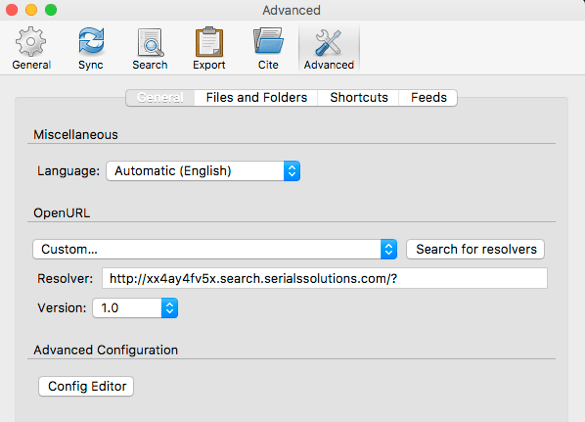 In the Advanced tab, add the following link to the Resolver field: http://xx4ay4fv5x.search.serialssolutions.com/? Zotero can be used to work collaboratively with groups. Create private or public Zotero groups to build libraries collaboratively, annotate documents and cite sources in collaborative projects. Zotero can populate a bibliography on your website. You can use the ZotPress plug-in to funnel Zotero libraries into a WordPress website. For more advanced users, Zotero can be used to create bibliographies on numerous platforms, including Drupal and Omeka. For examples of websites using Zotero, check out Berkeley's Reproductive Justice Virtual Library and the Franco-American Library. Zotero can serve as your RSS feed reader. With the recent release of Zotero 5.0, you can now use Zotero to capture RSS feed content. You can read an RSS feed in Zotero, and then easily import specific items from feeds into your library with all the necessary metadata to cite the item later on. Zotero can extract into a file any text you’ve highlighted in a PDF. Using a plugin called ZotFile, you can save PDFs annotated in Adobe Reader to your Zotero library and easily extract all highlighted text and comments into note files. You can even configure Zotero to extract differently colored highlighted sections into separate notes. To get started with Zotero, just download and install Zotero 5.0, install a browser connector plug-in, and register for a free Zotero account. To learn more about the advanced options above, contact the library.